Since the implementation of the Occupational Safety and Health Act in 1971, the Occupational Safety and Health Administration’s (OSHA) mission has been to set and enforced standards to assure a safe work place and to assist employers in reducing or eliminating workplace hazards. Establishing a process in identifying and assessing potential hazards associated with manufacturing, process, or construction jobs may be effective in mitigating and assessing potential hazards. An effective approach in understanding a hazard with a job is a Job Safety Analysis or JSA. A JSA facilitates an understanding of each job task, identifies hazards associated with the tasks, and establishes measures to provide for reasonable safety. 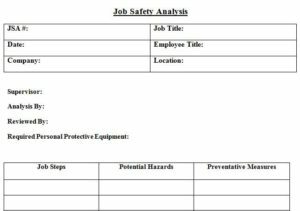 When conducting a JSA, a template may be a beneficial tool to evaluate and analyze hazards. Each job is broken down into a defined sequence of tasks. A rule of thumb is to break the job into no more than ten steps. Following the ten step rule will help with consistency and focus. Involving employees in the JSA process can also help dial in on key aspects of the process. Ask a simple sequence of questions for each task to evaluate hazards that exist or can potentially occur. For example: What are the types of hazard: motion, thermal, noise, energy? How is the hazard controlled? How does an individual interact with the machine or process? What is the severity of the hazard? These questions will help develop a thought process for identifying and addressing hazards. Keep in mind not all tasks will be associated with a hazard. Once potential hazards within each task have been identified, the next step is to evaluate preventative measures. One process used to evaluate preventative measures is a Hierarchy of Controls. A Hierarchy of Controls is a thought process whereby a hazard is evaluated for elimination, substitution, or a different process implemented by adding engineering controls, administrative controls, or PPE (Personal Protective Equipment) to the job. After finalizing a JSA, communicate findings within different levels of management, as time and resources may be necessary to resolve identified issues. If you would like to hear more about how to conduct a Job Safety Analysis or would like to discuss having a JSA conducted with your organization, please contact Robert Ridpath for more information.